Six firefighters from the Peterhead Firestation Red Watch successfully completed a 75 mile walk from Peterhead to Dyce and back. 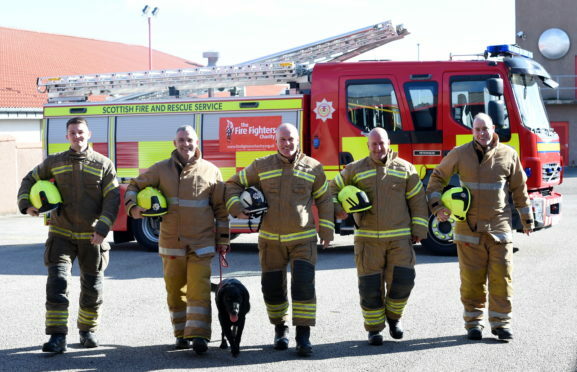 Pictured are from left, Dean Peacock, Malcolm Cooper (with dog Buddy), Robbie Sturrock, Gary Collins and James Simpson. Six crew from Peterhead donned their full uniform and trekked 75 miles from the Buchan town to Dyce and back this week. It was part of efforts to raise £5,000 to help the Fire Fighters Charity mark its 75th anniversary. And after successfully completing the hike they have smashed their target, with almost £7,000 being donated. The trek took place on Wednesday and Thursday and the route took the six members of Red Watch along the now abandoned Banff and Buchan railway line to the fire station in Dyce. After an overnight stay at the Pitmedden Road base, the firefighters walked back to their own station on Prunier Drive, Peterhead. Their journey took about 15 hours each way. Watch manager Robbie Sturrock led the hike along the old railway and said it was quite a challenging venture given they were wearing their helmets, tunic, leggings and boots. Mr Sturrock, who has been a fire fighter for 26 years, said the endeavour had been a lot tougher than any of them had expected. He said a few of the crew have been left with blisters following their exploits as he thanked people for backing their mammoth effort. Mr Sturrock said: “It was a lot of hard work. “We knew it was going to be challenging, but we really underestimated how hard it would be. “Some of the guys have been left with a few blisters. “The entire team put in a lot of effort and that was important because it was all about the team and not individuals. Mr Sturrock was joined by his colleagues Gary Colins, Malcolm Cooper, James Simpson, Stuart McLelland and Dean Peacock. There will not be much respite for the team, however, as most are due back at work in Peterhead today. For more information about the fundraising bid and to support the cause, visit www.justgiving.com/fundraising/red-watch-75miles.